I like parking next to other Hybrids. Seems like the impact on a passerby would be greater seeing two or more of them parked together. "Oh, now everybody's getting them...maybe I should look into it." 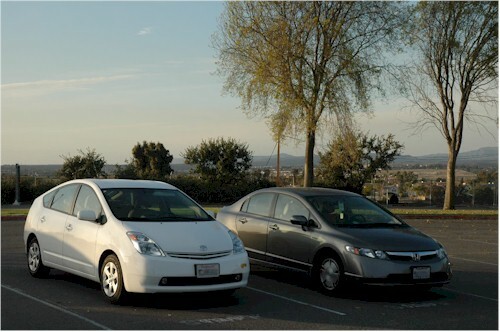 Anyway, this time I took a photo of my Civic next to one of those Prius contraptions. Earlier this week, I've been telling my students about a hypothesis I have about my car's fuel economy and the brand or octane rating of gasoline. It seems like putting higher octane and/or Shell gasoline increases the gas mileage of my Civic. So far, the data support my hypothesis, but it's quite impossible to control other variables such as acceleration frequency, driving agressiveness, slope of the road surface, number of passengers, engine temperature, and highway vs city driving duration during a tank of gas. Nevertheless, it was a good example for my discussion of the scientific method this week. Maybe I'll use it in my other classes. Click on the photo to see some of my data.